Farmers and ranchers are some of the hardest workers out there. However, for as hard of workers as farmers and ranchers are, their equipment works even harder. Tractors and farm equipment are subject to much abuse from the rugged and demanding conditions of dry, dirty and untamed fields. Tractors deserve to be taken care of for all their hard work! Routine tractor maintenance and care are important for maintaining a longer life for your tractor and ensuring it performs up to the taxing demands of everyday work out on the farms and fields they care for. By performing these few simple checks after every use (or at least once a week) you can make sure your tractor stays running strong all season long. They will take you only a couple minutes to knock out and are well worth the time. Let’s get started. Here are 4 important, routine tractor maintenance checks. Oil is one of the most important factors for keeping your tractor running strong. It lubricates your engine and all its individual parts as well as helping to prevent overheating by absorbing heat given off by all its moving parts. Spending much of its time working in a hot field, that second part is particularly important. It’s healthy to change your tractor’s oil and oil filter about every 100 hours of use. But, in between that, regularly checking your tractor’s oil level is important. If there isn’t enough oil, your engine won’t stay lubricated and cool which can cause it to wear out and overheat faster. After every use, take a minute to check your dipstick. If your levels are below the recommended level, top it off. The farm and field can be an unforgiving place for tractor tires. From stubble, rocks, debris and everything else, tractor tires are at high risk of punctures, damage and excessive wearing down every day. Without a set of sturdy tires, a tractor isn’t much good. Before you call it a day, give your tires a quick inspection. Make sure there are no punctures, leaks or that you tire pressure is solid. Tires with low pressure are at greater risk of puncture and damage, so be sure to top them off with air if necessary. By checking your tires at the end of the day you can also catch any punctures, tears or damage right away and deal with them immediately instead of being surprised with a flat tire first thing in the morning. With all the dirt, dust and grass flying around, tractors can get dirty fast! If left unnoticed, all this stuff can work its way into every nook and cranny. Once it gets stuck it can gum up the works under the hood or underneath the vehicle and can even contribute to wear, rust and corrosion of the body leading to repairs and replacements. Treat your tractor to a nice cleaning at least once a week. You don’t have to go totally overboard with cleaning either. A simple lathering of soap and water is enough to do the job. What’s important is you do your best to hit tough to reach areas where dirt and dust can hide and do the most damage to your tractor. There are lots of hoses, belts and tubes under the hood of your tractor that help make it go. The rough conditions, heavy vibration can sometimes loosen or damage these components under the hood. Something as inconspicuous as a belt or a hose can make a world of a difference, so it’s important every small detail is in order. At least once a week we recommend taking a look under the hood to make sure everything is in working order. Check items like spark plugs, radiator hoses, belts and air filters to make sure they are still in good condition. If anything needs replaced, don’t delay and take care of it right away. 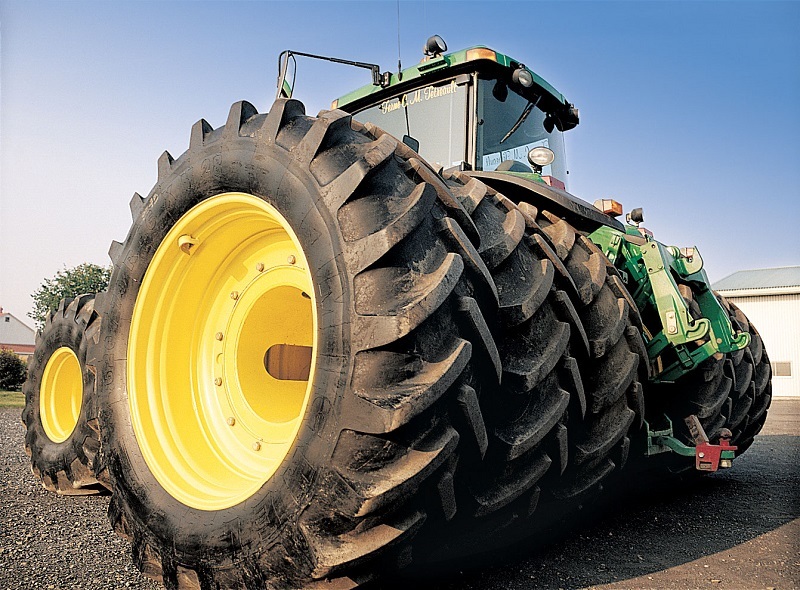 Raben Tire offers 24-Hour in-field service for any farm tire repair or replacement. Learn More!